Many of you might recall Barn Door Furniture, a contract and residential furniture maker out of North Carolina which closed in 2007. 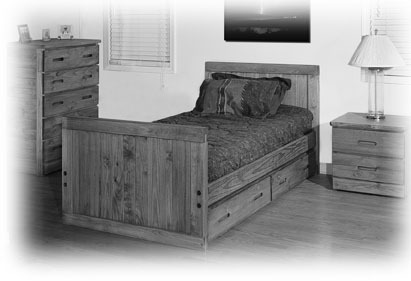 Barn Door produced a hearty line of rustic wood beds, bedroom furniture and seating pieces. So, is there any BARN DOOR Furniture left? Furniture Concepts had been the exclusive contract supplier for Barn Door's contract division until Barn Door ceased production. Furniture Concepts understands the value highly durable, solid wood furniture is in many contract environments - from camps & conference centers to group homes & healthcare. Furniture Concepts dedicates themselves to filling the gap by creating a new line of "crate style" furniture. TODAY, Furniture Concepts is the leading provider of the next generation of Barn Door style crate furniture. Furniture Concepts' proprietary Tough Stuff line is a warm nod to earlier crate style furniture but has been redesigned with cleaner lines and an overall more polished look. So if you were a fan of Barn Door you have not been forgotten. The same rugged contract quality is still available and affordably priced!